Synopsis: While Aragorn, Gandalf, Legolas and Gimli lead the charge against Sauron and his armies of Mordor, Frodo and Sam continue their quest to destroy the ring and banish evil from Middle Earth, once and for all. THE FOLLOWING REVIEW CONTAINS SPOILERS, SO BE AWARE MY PRECIOUSSSSSS…. 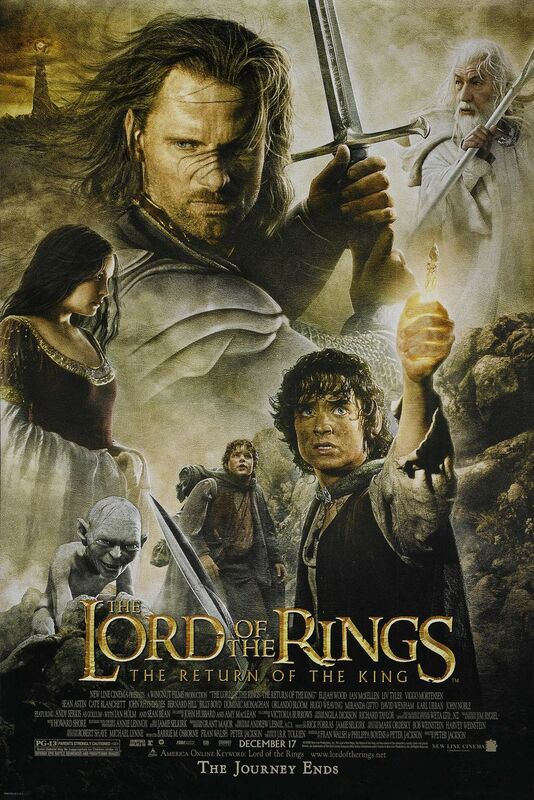 Review: The journey to bring The Lord of the Rings to the big screen was one that started all the way back in 1995, and that reached its conclusion in 2003 with this closing chapter of this masterful trilogy. You just did not want it to end, but all good things must come to an end, and there isn’t a better way to close the book on this epic masterpiece than to go and make what is without doubt, one of the best films ever made, and quite possibly the best film of the 2000s. New Line Cinema rolled the dice with Peter Jackson and this adaptation and this gamble paid off big time, with three tremendous movies making one of the best trilogies of all time. With Saruman and his armies now vanquished, the Iron Fist of Mordor and Sauron’s flaming eye is now firmly focused on Gondor as he bids to topple the world of men once for all. Yet in his path stand the rest of the Fellowship with Pippin and Merry following their victory over Isengard, who briefly rejoin the rest of the Fellowship to celebrate, but that joy is short-lived as the enemy prepares to strike. Gandalf and Pippin depart for Minas Tirith to help Gondor prepare for the imminent war and the rest of the Fellowship to mobilise Rohan and its armies for the grave and massive incoming army that is about to descend on the world of men. Sauron moves to conquer all and only it is in the hands of Frodo and Sam, aided by Gollum who all the while is growing ever more deceitful and treacherous, to stop Sauron consuming Middle Earth in darkness. Throughout the near ten hour run time of the entire trilogy (not counting the extended editions) Peter Jackson threw some terrific action sequences upon the audience. You thought the Battle of Helm’s Deep was outstanding and a wonder in terms of film-making, the battle of Pelennor Fields is somehow almost on another level. Trolls, Catapults of severed human heads flung at the walls of Minas Tirith, Nazgul, Oliphants, this battle has just about everything, and it’s a cinematic battle of immense quality that could and should certainly stake its claim as one of the finest ever put to screen, featuring among other things, Legolas take on an enormous oliphant all by himself, which leads to one of the best one liners ever said by the great Gimli son of Gloin. Given the stakes in the movie, the tone is considerably darker here, and this is noticeable from the very beginning with a rather twisted tale of how Smeagol was transformed into the creature otherwise known as Gollum. This dark tone is a recurring one throughout the film’s run time as Sauron’s power seems to be unstoppable for the Fellowship to contain. All the while, the Ring is taking a heavy toll on Frodo as he and Sam move closer to Mount Doom. All the while Gollum, purporting to lead them to Mount Doom, is scheming to try and take the ring back again. The script weaves between the different story lines as brilliantly as it can. Jackson, Philippa Boyens and Fran Walsh again wrote the screenplay and it was this screenplay that won the trio a well deserved Oscar for their efforts. Indeed the film swept the board at the 2004 Oscars, winning all of the ELEVEN Oscars it was nominated for, setting a record in process, jointly tying with Titanic and Ben-Hur for the most Oscars ever won. Although no one was nominated in any of the acting categories, everyone on screen gives utterly tremendous performances, right from those who were introduced to us in Fellowship and Two Towers, to those who were introduced in this concluding chapter. Of the new cast, John Noble’s Denethor, the father of the late Boromir and Faramir (David Wenham) certainly makes an impression, and quickly becomes a very dis-likeable man due to his mistreatment of Faramir, who he views in a considerably lesser light than his brother. The extended edition of Two Towers introduces the audience to Denethor but it’s here where he shows his utter contempt for Faramir. Viggo Mortensen shone as Aragorn in the previous movies, but here he really steps up to the plate as he accepts his true destiny, to become King. Also deserving of praise is Miranda Otto as Eowyn. “I can fight,” she says in Two Towers before the Wolves of Isengard attacked, and boy was she right. She certainly showed a woman can fight and own a battle scene just the same as a man. Sean Astin and Elijah Wood are also tremendous but Astin in particular really shone as Sam battles to support Frodo who is becoming corrupted by Gollum’s influence. There really is no shortage of superlatives that can describe The Lord of the Rings trilogy in all of its magnificence, but Peter Jackson could and should remain immensely proud of what he and his team brought to the big screen. If Tolkien could see what Jackson did with his beloved book, he would surely be thrilled that his masterpiece was brought to life in such spectacular fashion. If you count the extended edition, these movies are just over eleven hours of pure cinematic joy, spectacle, drama and emotion with so many wonderful and brilliant characters. The Lord of the Rings trilogy has cemented its status as one of the best that has ever been put to screen with three perfect movies that have secured their well deserved place in the record books, and will hopefully be adored for generations and generations to come. The third chapter in a trilogy can so often be a huge let down. Not a chance of that happening here, this is pure cinematic perfection and glorious entertainment, the trilogy took its well deserved crown. One trilogy to rule them all!